Wiggles looked at his owner, a Uni named Connor, apprehensively. "Go ahead, Wiggles!" Connor said before nudging him forward with one hoof. "You've been through worse with the lab ray... besides, there might be treasure!" Wiggles took a deep breath and jumped into the Symol Hole for what felt like the thousandth time. Once again, too scared to even look for treasure, he covered his eyes and stayed in the hole for a few moments before sticking his little head back out. Connor sighed and wondered (for what felt like the thousandth time) why, in ten years of coming here every day, she had never found anything down in the mysterious hole. "Come on, let's go home," she said. Wiggles cuddled against her and let out a small meow. It wasn't that he wanted to disappoint Connor, but despite his lion-like appearance, he just didn't have the same zest for adventure as she did. In the beginning, Wiggles wasn't even sure if Connor was the right match for him. She won him over with snuggles and treats, but he still often wondered if she wouldn't be better off with a Pfish or perhaps a Hydruplit. He let out a tiny cry of despair at the thought of being replaced, causing Connor to turn around and nuzzle him with her velvety nose. "Tomorrow is another day," she said. "I'm sure someday soon we'll figure out the secret." She picked him up to let him ride on her back, where he curled up next to her luxurious mane and heaved a sigh. If only he could explain to her that the potential treasure wasn't the problem, but that he felt like a burden to his brave companion. Her rhythmic gait soon made him drowsy, despite his anxiety, and he fell asleep. Upon awakening, he knew immediately that something was wrong. He could feel Connor’s hair standing on end, and the tension in her powerful muscles. "Oh no," he thought worriedly. "If Connor is afraid, then this must be serious trouble." He hopped off her back and onto his feet, and then followed her line of sight to the dark faerie standing in the path. He squealed and quickly hid behind his owner's hooves. "Well, I was just on my way to see Illusen, but what do we have here?" said the dark faerie silkily. "A little Noil, is it? What fun! He would be a perfect present for my niece," she cackled. "How does 200,000 Neopoints sound? It's far over asking price, as I'm sure you know." "You can't have him," Connor declared. Wiggles looked at Connor hastily. How could she possibly turn down that kind of money? It was more than any silly treasure that they would ever find. Turning back to the dark faerie, he growled and took a step backwards. "I'll have him one way or another, silly girl," the faerie replied. "It would be in your best interest to accept my offer. I'll tell you what -- I'll throw in a new Petpet, as well... any kind you want. Haven't you ever wished to have a Meowclops, or perhaps a Bartamus? You would be the talk of the town!" Wiggles gulped nervously. This was it, he decided. There was no way Connor would choose him over such a rare and daring Petpet. A small tear slid from his eye and he hung his head. "Are you crazy?!?" Connor laughed in a decidedly hostile way. 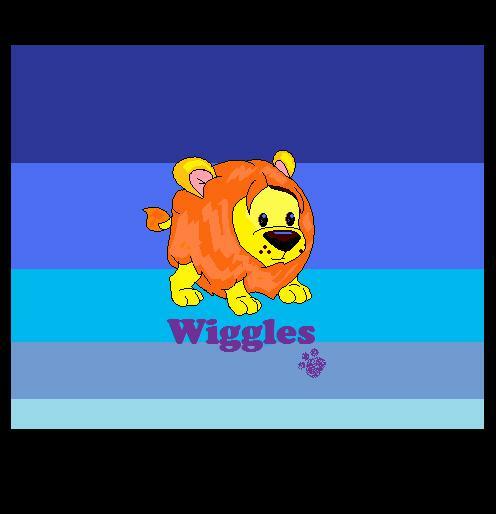 "Wiggles is my best friend! I wouldn't even trade him for your wand! Whatever you have to give me, it could never be worth more to me than my dear, sweet Noil." Wiggles could barely believe what he was hearing. 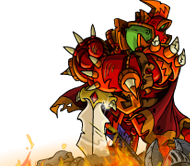 Connor would rather have his companionship than own a Wand of the Dark Faerie, one of the most valuable items in Neopia? Flabbergasted, the dark faerie took a slight step backward before scowling and advancing on the pair. "I'll turn you into a Mortog!" she screamed. "You'll spend the rest of your days in Meridell being kissed by strangers and exploding!" She began to utter an incantation and an ominous green light surrounded her. She looked on her other side and turned in a complete circle, temporarily forgetting about the impending doom. The witch began to glow brighter, and a menacing ball of light was developing between her outstretched hands. Just then Connor saw her beloved Petpet, running through the shadows created by the dark faerie's spell -- headed straight for the faerie! "Oh Wiggles, NO!" she shouted fearfully. She rose up on her back feet and prepared to charge after him. Lightning exploded in the air, turning the world momentarily white, and causing her to squeeze her eyes closed. At the same time, a crack of thunder deafened her. She was sure that, when she regained her hearing, the next word out of her mouth would be "Rrribbit." Despite her worries, her concern for Wiggles was growing by the moment, and her eyes flew open to take in the scene before her. Wiggles was on his back next to... a Mortog? She looked down at her unquestionably Uni-shaped shadow and then back to the two Petpets on the ground. Connor swiftly galloped over to Wiggles and prodded him with her nose. He let out a tiny mew and opened his eyes to look at his owner. "Your fur is singed! Are you okay?" Connor asked him. He sat up and shook himself before noticing the Mortog behind him. He gave it a sniff and growled. Connor nodded her head. "You saved the day, my friend! I've never seen anything so brave." She leaned forward so that Wiggles could put his paws on her nose and rub his face against her horn, which was his favorite way to show affection. She scooped Wiggles up onto her back and resumed the journey home, telling everyone they met on the path about how her little Noil was brave enough to stand up against a dark faerie. Wiggles couldn't stop purring the whole way home. The next day they went back to the Symol Hole to look again for treasure. Wiggles ran ahead and spun around in circles, eagerly waiting for Connor to catch up. She laughed at his excitement and quickened her pace. "Okay, Wiggles. I'm here," she smiled as he sat down and flicked his tail. "Go ahead, let's see what we find." Wiggles took a few steps back to get a running start and cannonballed into the hole. Well, this isn't scary, he thought as he looked around for the first time. "In fact, there's nothing down here but dirt!" He climbed back out of the hole and mewed at his best friend. "Nothing again, huh?" she said and then grinned. "I guess we'll just have to try again tomorrow!"